H.H. Karmapa gave two days of teaching hosted by Lama Jampa Thaye and the Dechen sangha on 27 to 28 July in Manchester. His Holiness bestowed two initiations, both of which were attended by over 350 people from the U.K. and Europe. 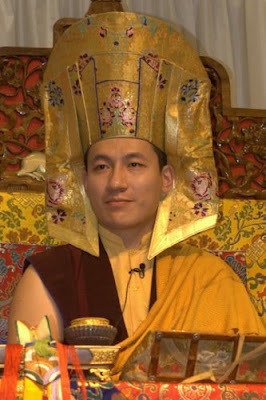 The first initiation was the empowerment of Karma Pakshi, the second Karmapa. This initiation comes from the great Kagyu master, Yonge Mingyur Dorje who had a vision of Karma Pakshi whilst meditating. The second initiation, White Tara, is found in the collection of teachings assembled by the 9th Karmapa, Wangchuk Dorje, known as Chikshe Kundrol ("Knowing One, Liberating All"). The public event of the visit was an evening teaching, entitled "Way of the Buddha" which drew a crowd of 600 people who packed the city centre venue to hear His Holiness’s timeless words. His Holiness taught and read the lung for "The Thirty-Seven Practices of a Buddha's Child" by the famed Sakya and Kadampa master Thokme Zangpo. In order to dispel obstacles, His Holiness, Lama Jampa and Nendo Rinopoche led the full Mahakala puja, the Khamyigma, in the Kagyu Ling shrine room. This is a puja performed daily in Karma Kagyu monasteries and regularly performed by the Kagyu Ling sangha. Mahakala, Dorje Bernakchen, belongs to the Karmapas and is the protector of all Karma Kagyu practitioners. All the attendees rejoiced at this auspicious occasion and it truly felt as though a circle of protection surrounded Kagyu Ling and the Dechen sangha. To mark the close of this extraordinary visit, His Holiness was guest of honour at a garden party in the grounds of Dechen's Manchester centre, Kagyu Ling. At the end of the evening, Lama Jampa gave a moving address and mentioned that to be in the presence of His Holiness was to be in the presence of a bodhisattva and a vivid illustration of why we practise the dharma.